Lifelong martial artist with 28 years of training and 20 years of teaching experience. With extensive experience serving in tough military and police forces as well as working as a trainer for various law enforcement agencies, Jeremy Haas has qualifications that are hard to equal. Tough, skilled, and determined, Jeremy seeks to instill his passion and skill into his students. Through the course of his life and work experiences, Jeremy Haas’ extensive training background gives him exceptional ground work for his teaching career. Civilian self-defense training combined with remarkably diverse military and law enforcement training sets him apart as a multi-faceted trainer. With his varied military background, Jeremy Haas has a distinct advantage in offering self-defense instruction to individuals. He has helped hundreds of women, children, elderly, and others learn how to beware of their surroundings, spot potential attackers, and be ready to defend themselves should the unthinkable occur. Besides typical classroom settings, Jeremy has offered training in churches, schools, and civic organizations, using his skills and expertise to empower many to break through their fears and be ready to stand up in their own defense. 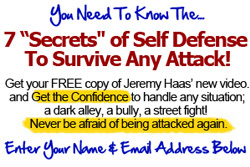 Jeremy Haas – a strong commitment to empower individuals in a variety of self-defense skills. Commitment backed by unmatched experience, skills, and experience. Why choose less for your personal safety?